Enjoy the Dominican Republics newest Ecotourism area in Samana. Halfway between the port and town of Santa Barbara and Las Galeras, The Cove offers a laid back atmosphere, with spectacular ocean and beach views. Whales can be viewed from the beach. Within 30 minutes of the most popular destinations, including the 'Walk the Plank Zip Line', Cascade Lulu, Rincon Beach, Playita, horseback riding, scuba and snorkelling. Other popular attractions include deep sea fishing, boating, Los Haitises National park, Kayaking, ATV tours, El Valle Beach, El Limon Waterfall, many restaurants, and the town of Las Terrenas 45 minutes away. We have been enjoying The Cove since 2006 and recently purchased this Condo for rental. All amenities are included for an 'at home' feeling. The scenery is spectacular. Secluded and protected Cove with crystal clear water, set to a backdrop of water and mountains. Wake up to magnificent sunrises and colourful sunsets. Migrating Whales can be seen from the beach January through March. 2nd story condo with amazing panoramic unobstructed views, cathedral ceilings, excellent breeze, and 2nd floor adds privacy, split units that are more quiet and more efficient than regular air conditioning units. Sidewalk around the building and leading to the street. No cable or access to any TV channels. For use only to watch DVD's. Some available, but suggested to bring your own. A huge thank you to the hosts! This place is amazing! It has everything you need! Semi private beach, no need to drive to another beach unless you want to and a private pool. If you need anything or have questions the hosts are extremely responsive to email. We did whale watching with Kim - highly recommend. This stay is in the heart of true dominican living and not a "touristy" area. It was absolutely a trip we will remember and one we will return to very soon. The onsite manager CoCo is so informative and is always smiling. I honestly can't say enough about the condo, the Cove, the people, the workers, the area, the things to do, the places to eat...ALL of it! Thank you so much for leaving a review. I am delighted to hear you had a great vacation at my condo and hope you will return in the near future. We really enjoyed our time at Claire's. The condo was clean and the furnishings were exactly as pictured. Coco was very friendly and helpful. We were able to see whales right from the beach! I am glad you enjoyed my condo and hope you were able to relax and unwind during your stay. I am thankful for your business and would greatly appreciate any suggestions you might have to make future renters' stay even better. Our family of five stayed here for a week and it couldn't have been more perfect! Our kids are ages 5, 7 and 9, and they loved the pool and the beach. My wife and I loved exploring the local beaches and eating at the local restaurants, but by the end of our trip we couldn't get the kids out of the pool. The pool has a zero-entry slope that was great for our 5-year-old, and our 7-year-old loved playing leap frog on the built-in bar stools. The other residents/guests were very helpful and gave great tips on where to visit and eat. The Texaco gas station just up the road had almost everything we needed in terms of food and drink for the condo. Overall it was a great trip! 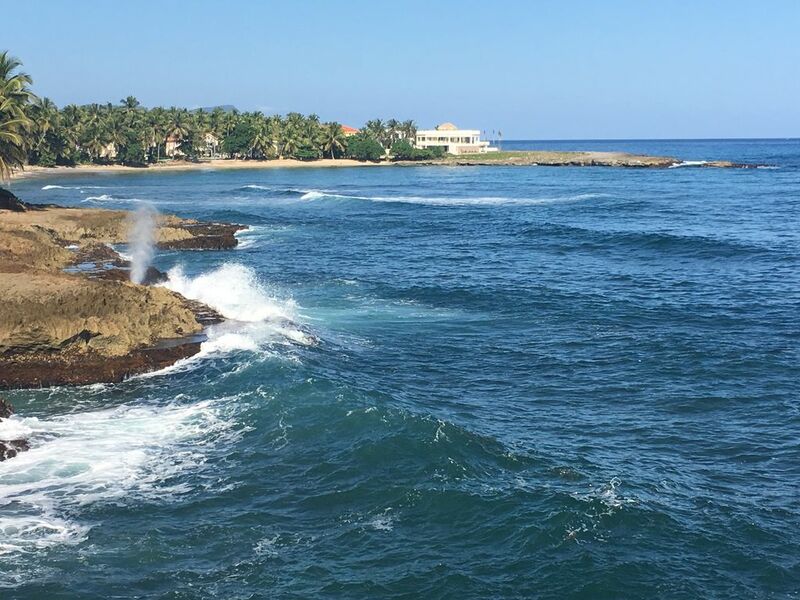 Our favorite stops were La Playita, Playa Rincon and El Monte Azul restaurant. All the locals were very friendly and always ready to help give directions or interact with our family. The condo was clean, cool and well-stocked - it had everything we needed for making meals and relaxing between pool/beach runs. Coco and the other staff at the condo were always helpful and it was reassuring that there was always somebody around that could answer our questions and greet us with a smile and a wave. This was a great vacation and we definitely recommend this property! We had a lovely experience staying at The Cove and visiting the surrounding areas. The condo is located very close to both Samana for Whale Watching and to Galeras and the amazingly beautiful Playa Rincon. On our last day we chose to stay around The Cove and relax poolside. We spotted a whale from shore and watched for another 30 minutes as it went by. The condo itself could use a few upgrades, but everything is in working order. Claire was very gracious and flexible with us about checking out leisurely on our last day. All in all a fabulous weekend! I am glad you had a nice time at The Cove with your family. I am always happy to accommodate renters whenever I can, so late check out on your last day was no problem since the condo was not rented that day. I hope you will return to visit soon.